jika persie gak cidera bisa top scorer kali ya..
"In the first half we were 1-0 down but were a bit unlucky because we were never under threat. We had a lot of possession that we couldn't transform into any dangerous situations for, in my opinion, two reasons. One,Tottenham defended very well and two, we were not good enough with our final ball in the final third. "That is the story of the game today until Robin Van Persie came on. It transformed our game in the final third. Today we had a lot of possession but were relatively inefficient because our passing was not quick enough, not sharp enough. We had a lot of ineffective possession. "He has not kicked a ball for five months in a football team. You could see straight away when he came on that he could give us something different and something special. The bad luck we have this year is that we go into the final sprint of the season with many good players out. You could see tonight that it is too much." robin van persie masih menunjukan kelasnya..
oughhh ... akhirnya rindu dendam terobati td malam. aksi2nya masih berkelas. gomes dibuat pontang-panting ama tendangan2 kaki kirinya. semoga disisa 4 match berikut tetap fit dan bisa bikin goal. robin van persie. clap clap 3x ! 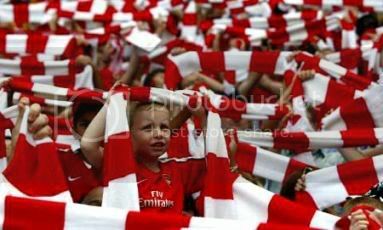 5 bln absen, tp dah lgsg ok maennyah..
just like his dad love berkamp..
katanya v.persie maenya lagnsung keren ya? wa lebi prefer RvP disimpen aja klo blm fit bener... pertandingan sisa da ga begitu penting.. kecuali kita emang ngotot mau incer juara 2..